USER SCORE:72%The percentage of users who liked this based on high quality reviews from sources such as Google Play, iTunes, and Amazon Music. Above 75% is green. ? 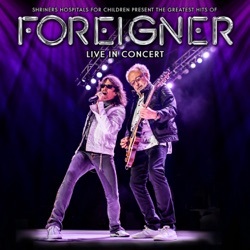 The Greatest Hits Of Foreigner Live In Concert is the eighth live album by Foreigner, released by Trigger Productions on February 15, 2019. Good songs But where is Lou Gramm??? These older bands that release live albums of their hits with a new singer and only one or two original band members is strictly a cash grab. Release some new material with the new guy or bring the old singer back and put out a live album! Great cause! To all the haters out there, 1: Kelly Hanson has now been in Foreigner longer than Lou Gramm was. 2: Lou announced he's retiring so no he won't be returning. Great tunes, great band, great cause raising money for the Shriners! Rock on Foreigner! Best of Foreigner Live I saw the group in 2016 and thought they were great. The lead singer sounded like the original and had a real stage presence. I plan to get this album even though I have a couple of Foreigner Greatest Hits CD’s. This band is freaking awesome!! I had the honor of seeing this band live the summer of 2016. They rocked from beginning to end. Kelly Hansen does an amazing job on lead vocals. I would definitely enjoy seeing this band play again. bring back Lou Gramm he new singer Stinks!!!! !